The GNW-30 production type 2-head CNC cylindrical grinder is perfect for large to small production on a variety of workpieces. 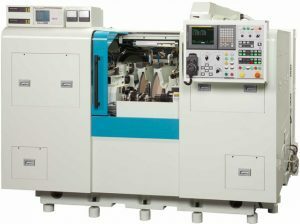 The GNW-30 offers simultaneous two-diameter grinding and synchronized driving workheads. The double-wheelhead design allows two different surfaces to be ground in one setup and one continuous operation, significantly reducing cycle times while maintaining high part accuracy.